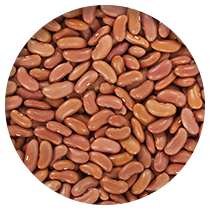 The Bean Institute — This website is intended to help both dietitians and consumers improve their awareness and understanding of the nutrition and health benefits of dry beans and provide interesting ways to add them to your menu! To learn more, go to www.beaninstitute.com. Connect with The Bean Institute on Facebook, Twitter, Pinterest and Instagram! The World Bean Kitchen: Passport to Flavor — The Culinary Institute of America’s resource on the use of beans in great cuisine. Northarvest partners with the Culinary Institute of America to provide digital media to consumers. There are various delicious bean recipes, videos and demonstrations that can be accessed through their Facebook, Pinterest, YouTube, Twitter and Instagram! 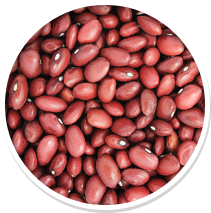 Dark red kidney beans are large, reddish-brown kidney-shaped beans containing a robust, full-bodied flavor and have a soft texture. Dark red kidney beans are often cooked or canned as whole beans. They are popular in salads, chili, bean casseroles and soups. 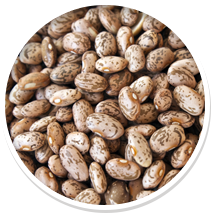 These medium-sized mottled beige and brown skinned beans contain an earthy flavor and powdery texture and can be found canned or dry bagged. When cooked, they lose their mottling and turn light brown. Pinto beans are most often used in refried beans, bean paste, chili and other Mexican dishes. 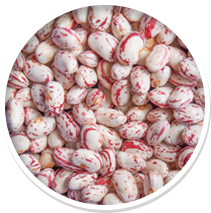 Cranberry beans are medium-sized oval-shaped beans with mottled tan and red skins. When cooked, their red specks disappear. With their creamy texture and chestnut-like taste, they are a great addition in northern Italian, Spanish and Portuguese dishes. Navy beans, or pea beans, are small white ovals with a mild flavor and powdery texture. They are commonly found in canned products or in bagged form. They are used for cooking in pork and beans, soups, stews, baked bean dishes and are great pureed. Pink beans are small, pale-pink beans with a rich meaty flavor and slightly powdery texture. Pink beans supplement the supply of edible beans used in canned chili and other products. 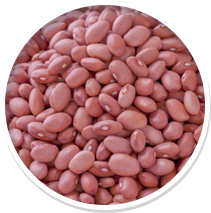 Related to kidney beans, pink beans are often served barbecue style, cooked in Old West recipes or served with spicy seasonings. Small red beans are small, oval-shaped with red skin. They have a more delicate flavor and softer texture than kidney beans. These beans hold their shape and firmness when cooked. Small red beans are popular in Cajun, Creole and Mexican cuisine. They are a must for red beans and rice, soups, salads, stews and salsa. 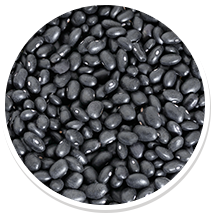 Black beans are small oval shaped beans with deep black skins and a dark-cream-to-gray flesh. They have a soft texture and a mild, sweet flavor. The black bean, sometimes called turtle beans, are used in classic Latin, American, Caribbean and Southwestern (U.S.) dishes. They are also a staple in black bean soup and the Brazilian dish of Feijoada. 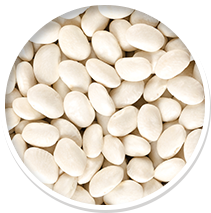 Great northern beans are a medium-sized, flat kidney-shaped white bean. They like to take on flavors of other foods when cooked together. Great northern beans are excellent for baking and go well in baked bean recipes, casseroles and salads. 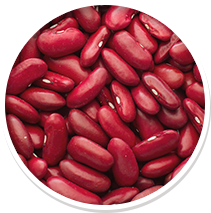 Light red kidney beans have a full-bodied, robust flavor. These large, kidney-shaped beans are popular in the Caribbean, Portugal and Spain. They are most commonly used in chili, baked dishes, salads and paired with rice. 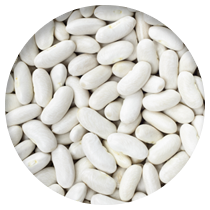 Also known as cannellini beans, the white kidney bean is a large white bean with a firm texture and skin, containing a nut-like flavor. 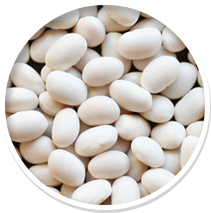 The white kidney bean is popular in Italian cuisine, including minestrones, fagioli’s and salads.